Computerized tomography scan (CT) is an important tool in evaluation and assessment of diverticulitis disease. Previous Studies demonstrated different approaches depending on CT scan findings, which vary from clinic treatment to guided drainage or even urgent surgery. 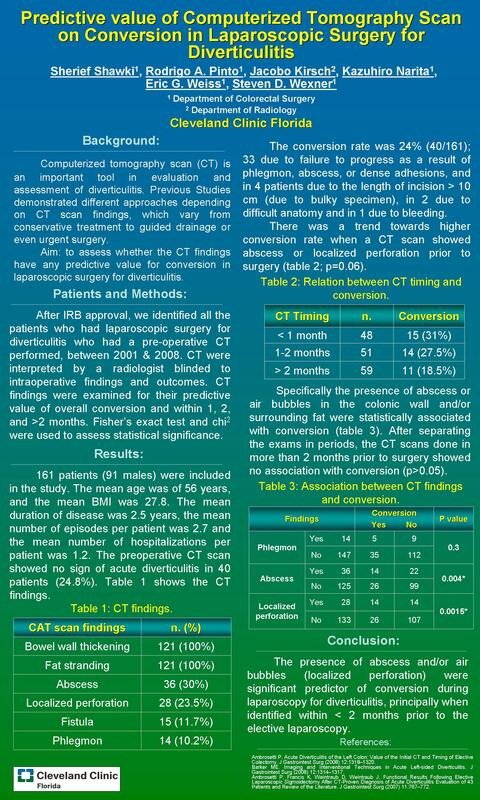 The aim of this study was to find out if CT findings have any predictive value for conversion in laparoscopic surgery for diverticulitis. Fisher’s exact test and chi2 were used to assess statistical significance. A total of 161 patients (91 males) were included in this study. The mean age was of 56 (range 24-83) years, and the mean BMI was 27.8 (range17.5-34.5), and ASA I-21, II-115, and III-26 patients respectively. The conversion rate was 24% (40/161); 33 due to failure to progress as a result of phlegmon, abscess, or dense adhesions, and in 4 patients due to the length of incision > 10 cm (due to bulky specimen), in 2 due to difficult anatomy and in 1 due to bleeding . CT findings were positive in 74% of patients (n=119); 100% with bowel thickening and/or fat stranding, 23.5% air bubbles in the colonic wall or surrounding fat, 11.75% phlegmon, 30.2% abscesses, and 10.2% fistulas. 48, 51 and 62 patients had their CT done within1, 2 and >2 months of operation respectively. The timing of CT either before or after 2004, or based upon 1, 2 or >2 months from surgery were not significant predictors of conversion (p>0.05).